MQ-9 Reaper. United States Air Force photo by Senior Airman Larry E. Reid Jr. While Noah makes the very good point that the Pentagon’s favored euphemistic kinetic/non-kinetic distinction is inherently ridiculous, he gets the logic behind the “Predator” name exactly backwards. 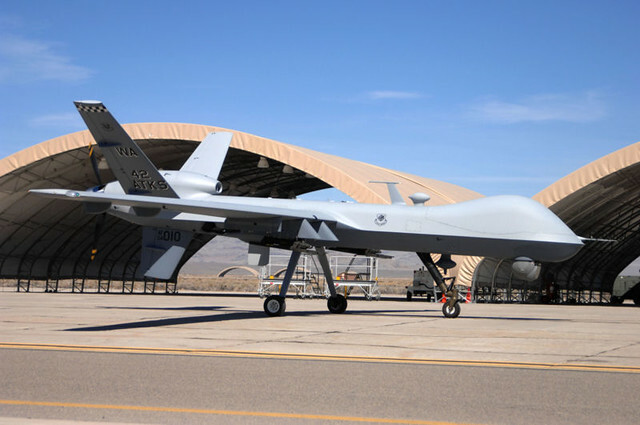 While the aircraft that would evolve into the MQ-1 was first flown as the “Predator” in 1994, the Air Force only began arming Predators in 2002, meaning that the MQ-1’s menacing name predates its strike role by eight years. Similarly, the MQ-9’s “Reaper” designation isn’t exactly a euphemism — I think its fair to say that few people would be confused about the lethality of an aircraft whose name evokes the personification death. And while the MQ-9’s upcoming, jet powered General Atomics “Avenger” sucessor’s name drips with indulgent self-righteousness, it isn’t exactly misleading: Predators, Reapers, and Avengers all kill. Anyways, this is all a bit silly — aircrafts’ given names rarely have anything to do with their missions. The F-15 and F-16, both designed from the ground up as ferocious combat aircraft, are innocently designated as the “Eagle” and “Fighting Falcon”, while the more martially named A-5 Vigilante saw most of its service in the reconnaissance role. The Pentagons’s linguistic slight-of-hand is an important part American culture’s internalization of contant war as the new normal. But sometimes a name is just a name.